Fred Levine and Little Hard Hats present the second edition of the BIG MACHINES series. 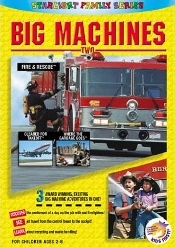 Big Machines 2 teaches children about fire engines, jet planes, and waste handling. Also included is a segment on the importance of recycling. The three-part volume features the titles "Fire And Rescue!," "Cleared For Takeoff!," and "Where The Garbage Goes!" DISCOVER: The excitement of a day on the job with real firefighters! SEE: Jet travel from the control tower to the cockpit! LEARN: About recycling and waste handling!